I don't know whether I wanted the "kissimu 3" table lamp to set up a mood, but I could certainly not imagine it without a soul! A structure potentially leading each and everyone of us to some sort of a far-fetched dream. 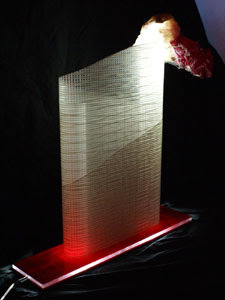 The "kissimu 3" goes beyond the "stability" intrinsically associated with the concept of a table lamp! In a way it rather symbolizes a "taking off", referring to life's constant permutation and non-permanency. The "kissimu 3" is at its best in contexts where space is reduced to its bare architectural limitations. It is meant to provide breathing space, imaginary space but also intimate space. Quick tour of our recent exhibition at Ballarini Interni, Verona on 27 February 2008. Many thanks to them for this possibility, and to all of you that attended this pleasant evening.